FALSE: Muslim Women Protest in U.S.
A photograph of protesting "Muslim women" was taken in Tehran in 2013, not the United States in 2015. Claim: Photograph depicts Muslim women in the United States with anti-American phrases (such as “Down With U.S.A”) written on their hands. Muslim women HERE in America showing their appreciation for freedom by writing “Down With U.S.A.” on their hands. Women who have NO RIGHTS in Muslim controlled countries. Message to ALL MUSLIMS: Respect our laws, traditions, and American citizens – and show your appreciation for the freedoms you can enjoy here in America – OR GTFO !!!!!!!!!! 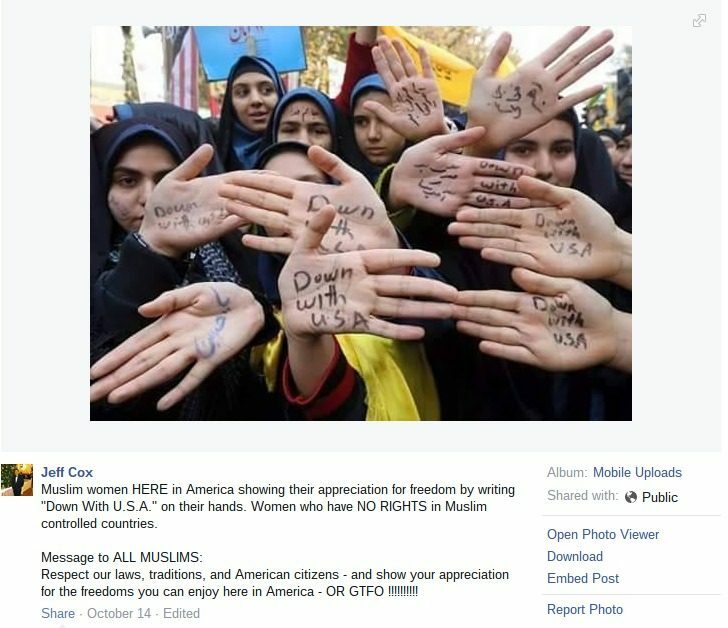 Origins: On 14 October 2015 a Facebook user published the above-reproduced photograph and caption (viewable here), claiming the image depicted “Muslim women HERE in America” displaying anti-American slogans written on their hands. And can someone tell me why these pieces of s@%t should be allowed into our country when they are saying down with America. I say let them die in that hell hole they are fleeing. All they are doing is infiltrating our boarders so they can destroy us. THE UNITED STATES SHOULDN’T ACCEPT ANY OF THESE REFUGEES AT ALL. ANYONE WHO SUPPORTS ALLOWING THEM INTO OUR COUNTRY IS A TRAITOR AND ENEMY TO THE UNITED STATES. Rs.